I have lived in Africa for 50 days now, and I’ve met too many people to even attempt to count. My team has hosted Rejoice Project Camps all summer for over 900 students, attended different churches every Sunday, and gone on A LOT of home visits. Obviously, the amount of people that we have interacted with every day this summer is insane. 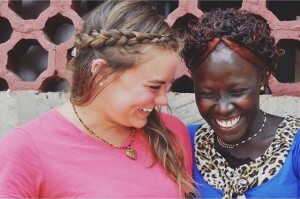 I have gained some incredible, deep friendships this summer in Africa, but one surpasses them all. When I think of the precious people that I have spent my summer with, this one sticks out among all the rest. Meet Everlyne Amani. I met Everlyne in our third community at the end of June. She probably weighs 100 pounds soaking wet, she has a smile that absolutely lights up the room, and I could listen to her gentle, beautiful singing all day and never get tired of it. Although Everlyne is tiny, she is one of the bravest, strongest, and most hard working women that I have ever met and embodies this truth perfectly: “She sets about her work vigorously; her arms are strong for her tasks.” Proverbs 31:17. We camped in our third community for 11 days straight and Everlyne stayed with us the whole time at our campsite. She sacrificed time away from her family and away from her work to help us cook all of our meals and to travel with us around her community each day. The first couple of days at the campsite, I’m embarrassed to admit that I didn’t talk to her much except for saying “thank you for dinner tonight” or other small phrases. One morning during my quiet time, the Lord gave me the word “depth”. It’s easy to just coast through life, but God desires for me to dive DEEP into prayer, dive DEEP into His Word, and dive DEEP into RELATIONSHIPS. I realized that my time here was flying by quickly, and if I wasn’t careful, I would miss out on this rare opportunity to spend TONS of time with Jesus every day and build lasting relationships with warriors of faith on the other side of the world. This is the day I realized without a doubt that Everlyne was a young woman that God had placed in this community specifically for me to invest in this summer. What really happened was that she invested in me, taught me, and impacted me more than I could have ever imagined. On June 23, my relationship with Everlyne took off! She spent the morning showing me around the market and as we walked we shared the basics of our lives with each other (age, family, hobbies, etc.). We had an immediate bond and all it took was for me to stop caring so much about myself and simply reach out to her. For the remaining days in the community, we spent every evening by the campfire together. Everlyne opened up to me more and more and began to entrust me with deeper, more intimate parts of her life. She is 24, mother of a precious 8 year old named Jimmy, and wife to Joseph. Sustainable work is hard to find here, so Joseph works 457 km away from home and is gone for 3-4 months at a time without seeing Everlyne or Jimmy at all. When he comes home, he can only stay for 10 days before setting out for 3-4 months again. Life here is hard. Some of my fondest childhood memories are when I would hear my dad come home from work every evening and I would greet him at the door and jump into his arms. I can’t imagine a constant cycle of my dad being gone for four months straight. I’m not married, but I’m sure having my husband gone for that long is even harder. Despite this part of her life that I would say is a hardship, Everlyne is unwavering in her faith. She finds her strength and worth in the Lord. She works hard every single day and finds joy in her situation because THE JOY OF THE LORD IS HER STRENGTH. The Lord is her protector when Joseph is away. The Lord is her lover when Joseph is away. The Lord is her provider when Joseph is away. The day before we left the community, Everlyne pulled me aside and told me how much I had blessed her life. She gave me a necklace to remember her by and she sent gifts to my family in America as well. She told me that I was not just a friend, but I was her sister forever. Saying goodbye to Everlyne was painful because the relationship that we built in such a short amount of time is deeper than any other relationship that I have here. This week we hosted a Rejoice Project Alumni Retreat at the Choose to Invest compound. Eleven of the strongest Rejoice Project Leaders came to the compound on Monday afternoon, and guess who was one of the first to arrive?! EVERLYNE! We ran to each other and embraced each other as she walked in the house. I was overjoyed that the Lord brought her here so that we could spend 3 more days together going deeper in our relationship. She told me of all the ways God has been ABUNDANTLY faithful in her life and done so many exciting things for her and Jimmy since I left her on July 3. As I left her on July 3, my heart was so heavy, worrying that she would not be protected or provided for. Why did I ever worry?! The God of the Universe has promised that he will never leave or forsake her. I was so excited to catch up with Everlyne and praise God for lavishing His blessing on her and her family. Although I have not known Everlyne for long at all, my relationship with her is deeper than some of my relationships at home because it is rooted in Christ. The most important part of my life is the most important part of her life. I have learned this summer that when your relationships are founded in Christ, when you are honest and vulnerable with each other, when you take time to simply notice someone and ask hard questions, when you pray with each other and engage in spiritual conversations, it really doesn’t matter how long you have known that person in order to have a precious relationship. Everlyne has impacted my summer. My life. Honestly, I could write so much more about her because she is that amazing of a woman. I am thankful that she is forever my sister and I trust that God will unite us together again on this earth. But if I never see her again on earth, I am confident that I will spend the rest of eternity with her, singing praises to the the King of the Universe forever and ever and ever. Everlyne’s favorite verse is Philippians 4:4- “Rejoice in the Lord always; I will say it again, rejoice! !” So, join me in praying this verse over her and her family each day from the other side of the world.